Gallipolis City Commissioners discuss the year’s coming challenges and needs. From left to right sit Tony Gallagher, Mike Fulks, Steven Wallis, Cody Caldwell and Beau Sang. 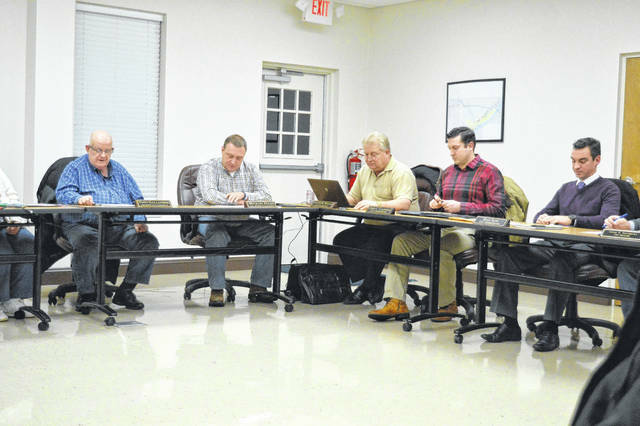 GALLIPOLIS — While Tuesday’s Gallipolis City Commission introduced new commissioners, and old, as they were sworn in for the coming year, it also raised the question as to whether the city’s financial woes may be seeing a temporary relief. According to City Clerk and Auditor Annette Landers, at the beginning of 2017, the city’s general fund had a carryover budget from the previous year of $233,595.10. From 2017 into 2018, it has a carryover of $385,542.68. Landers credited the city department heads with the finding along with Gallipolis City Manager Gene Greene. Landers said carryover funds were necessary at the beginning of a year to handle emergencies and standard city monetary needs before more tax funding was acquired as a new year pushed forward. https://www.mydailytribune.com/wp-content/uploads/sites/42/2018/01/web1_DSC_0485.jpgGallipolis City Commissioners discuss the year’s coming challenges and needs. From left to right sit Tony Gallagher, Mike Fulks, Steven Wallis, Cody Caldwell and Beau Sang.